Last fall Hurricane Maria hit Puerto Rico and absolutely devastated the Island. It started in the East-West corner and worked its way across the Island, destroying everything in its way. Puerto Rico has always held a special place in my heart. It was the first place I went to on a “mission trip” in high school and where I fell in love with the people, the culture, and the food. It was where I discovered that even if we couldn’t fully comprehend what each other were saying, we could still communicate. It was in Puerto Rico that I learned that the Holy Spirit can work wonders, even when there is a language barrier. It was in Puerto Rico that I saw first hand that no matter the culture, the skin color, the language, the age, the gender, the one thing that unites us all despite our differences is the love of God. A few weeks back, the pastor with whom I went on the first trip with asked me to join them again. I bought a ticket and three days later I was arriving back to my favorite Island. I wondered what it would be like going back post-Maria and suffice to say I quickly saw first hand. The hurricane wiped out homes, devastated schools, and destroyed beaches. Even almost a year after Maria swept through the Island, there is still so much damage and dissolution on the island. But amidst the ruins, there was one thing that I noticed the hurricane did not touch. The loving, hospitable, affectionate ambiance of the Island and the people that inhabit it. During a time that could have easily divided the Puerto Ricans, they instead banded together to rebuild and reconstruct what was destroyed. Instead of allowing it to divide, they once again demonstrated the caring and hospitable culture of the island. While the local government was failing to allocate supplies, funds, and reconstruction, the people took matters into their own hands. One of the first thing I noticed when I arrived in Puerto Rico was all the abandoned houses and buildings. After speaking to friends who live on the Island I learned that many people did not have the money to rebuild or restore after the hurricane hit last September, and had to leave their homes. Families were displaced, and many headed to the states to live with family members. Over the course of my visit, I met people from all over the Island. I spent time in Finca Piñones, a beach-side community, Dorado, a town on the northern coast, Toa Alta, also near the northern coast, Montaña, on the west coast, as well as a few others here and there. I spent the week with an organization on the island called “Soldados de Cristos,” which works to intertwine basketball camps with faith. 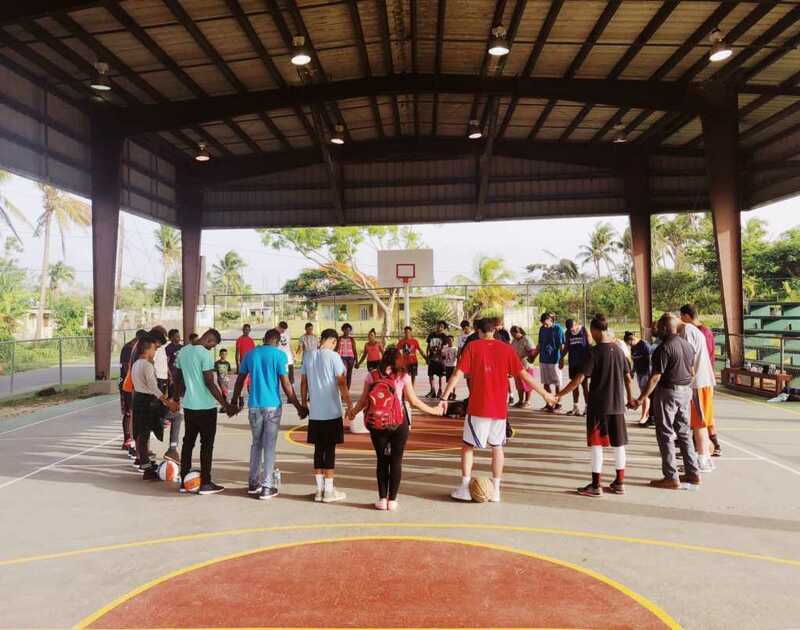 The group, which in English stands for “Solider’s for Christ,” was hosting basketball clinics all over the island the week that I visited, which is why I got to visit so many different towns while on the island. Countless “missions” groups head to foreign countries where they complete a short-term visit. Whether it’s building wells for the towns, or rebuilding destroyed homes after natural disasters, there are constantly teams going to and from the US to these storm-wrecked islands. But all too often these groups go as quick as they came, leaving behind a completed project, but a lack of knowledge on how the citizens can keep up with it. The cool thing about Soldados de Christos is that they work to implement basketball clinics, but also place Puerto Ricans in charge of the camps. Over the years, the organization has worked to educate young men to keep the clinics going even when the organization leadership is back in the states. Going back five years after my first visit, it has been incredible to see how much the organization has grown, and how the once young boys were now running the clinics. Victor Barriera, a basketball coach from Dorado and member of Soldados, whom I became friends with while on the trip, pointed out that the hurricane affected the youth basketball programs immensely, as it was hard to keep the teams together in wake of the hurricane. From a youth basketball coach standpoint, it has been very challenging to keep our players together. Many families moved to the USA after losing their homes, cars, everything. Some kids didn’t really have the economical resources to get on an airplane and fly out, so for many of them basketball is all they have to keep focused after such a devastating natural disaster. They’re the reason we keep grinding day after day, practice after practice, game after game. My respects to all coaches who have kept it together, be it basketball, volleyball or baseball. He also pointed out that the government wasn’t much help after the hurricane hit, something we observed in the U.S. But where the government fell short, the citizens were quick to complete themselves. “I can attest to having to chop trees, unclog drain ditches, nail roofs back together, make sure neighbors had water, food, etc,” Victor stated. But despite the damage, the destruction, and the displacement, Victor noted that there was a unification seen in the communities that brought them all together. “There were no groceries, 8 hour long lines to get gas, it was rough,” Victor stated in regards to the immediate aftermath of the storm. The worst part following the hurricane was the looming question of what was to come, Victor along with a few others exclaimed. Even though it has already been almost a year since hurricane Maria hit Puerto Rico on September 22, 2017, there is still so much to be done on the Island. “There is definitely a lot to be done. But let’s be honest, Puerto Rico will NEVER be the same after this. Some communities still don’t have power. Schools are still closed,” Victor added. But amidst the chaos and destruction, there is one thing that almost every person I came in contact with said: the hurricane made them stronger than ever. “The most important thing is we survived and are stronger now because of it,” Victor told me confidently. Even though the citizens have worked to get the island back to its original state, there is still so much work to be done. My heart broke as I drove by abandoned houses, destroyed restaurants, but most of all the schools that were in shambles. This past spring, it was reported that nearly a third of all schools were closing down on the Island. Many were destroyed during the hurricane, and many others could not stay open due to the floundering economy on the island. Many kids left the island with their parents after the hurricane, and in-turn school populations plummeted. Because so many families left, it has lead to the closing of schools, leaving the children and families who didn’t leave the island, education-less. In total, around 6,000 students have been displaced, and are now school-less for the upcoming semester, which started this week for most Puerto Ricans. Not only are many still displaced, but almost a year after the hurricane, there is still not an official death toll number for the hurricane. The Puerto Rican government has released death toll estimates in lieu of the hurricane, usually citing numbers under one hundred, but this week they released a new number that was absolutely devastating. The Puerto Rican government reported to Congress that there were 1,427 deaths reported in the four months following that could be attributed to the storm. George Washington University is leading a study in which they are reviewing what will be the “official death count.” The University was hired by the government after the death toll reports seemed to be fabricated. The study was originally estimated to be published in May but is now thought to be published next month. I encourage you to pray for the Island and the ongoing reconstruction that is taking place. Pray for the citizens to keep going even when they feel like things will never be restored to their original state. Pray for the children that they find schooling and don’t have to suffer educationally because of the government’s irresponsibility with funding. Pray for government leadership in Puerto Rico, that the corruption would get exposed, and faithful and caring people would be placed in leadership. Pray for courage, and protection during the upcoming hurricane season.